On July 14, 2011 at 7:30am, 2 men became our family’s heroes. From that moment on it seemed incredible to me that we had barely spoken to them, didn’t know their names and never had the chance to say thank you. How was it possible that there were people just out there that had played such a huge role in our lives and we knew nothing about them. This had been on my mind for quite some time and after going back and forth I reached out to Toronto Paramedic Services and asked if we could arrange to meet these men. I wasn’t sure what to expect; you see stories like this in the media and I always wondered how the paramedics really felt about these meetings. For someone who is not a paramedic, I had always imagined that the most difficult part of their job was the fact that they have to walk away without knowing the outcome of the call. Did meeting people just feel like another obligation of the job or does it actually help to bring some closure? 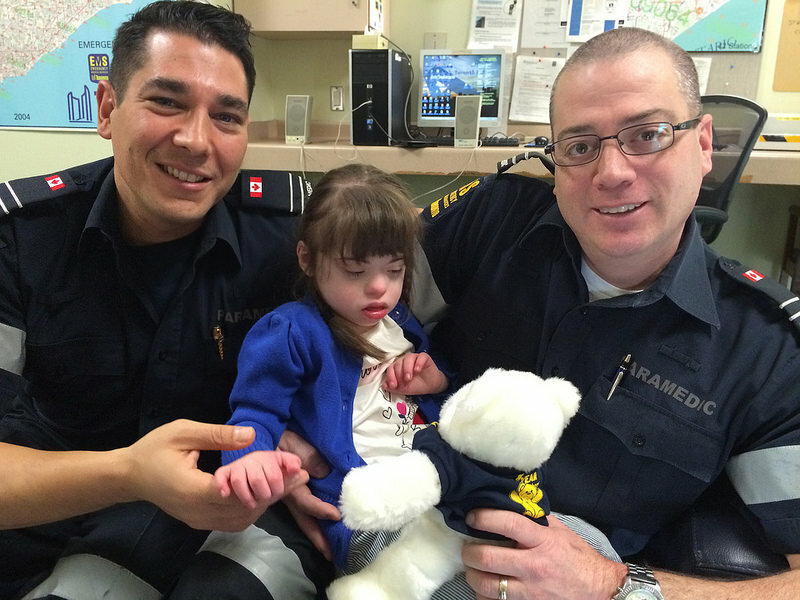 The commander who responded to my request answered that question right away – both of the paramedics who worked on Lily remembered her call vividly and were excited at the chance to meet again. To say that we were nervous would be a complete understatement. What do you say to the people who actually saved your child’s life, who literally kept her heart beating? We’ve had doctor’s do that, who have held Lily’s heart in their hands and we’ve been able to thank them, but this just felt different. Perhaps because there was no plan, no preparation on their part; they didn’t have scans or echo’s to look at, they just had the information that was coming up on their screen and with that little information, they created a miracle and saved us from a life of grieving. I didn’t know how we were going to get through saying hello without turning into a blubbering mess, let alone actually get out the words that I wanted them to hear. It was incredible to sit in a room with them, to have them see Lily with their own eyes, to her the story of that day from their point of view. They were able to give us information that we never could have known without them. They told us that, contradictory to what we had always thought, they were both in the back of the ambulance working on Lily and they actually thrown the keys to a police officer and had him drive. They were incredibly careful not to communicate with words so that my wife, who was in the front, would not panic because they were also scared that it wasn’t going to end well. We found out that one of them had made a special trip to Sick Kids after their shift ended that day to come and check up on her (under the guise of picking up a piece of equipment). We sat in silence, and tears, and listened to the 911 call and I have never been more proud of my wife. I can hear the fear in her voice, hear how terrified she was but she didn’t allow that fear to win – the recording could be used as an example of the perfect 911 call. She was so calm, communicating all of the information so quickly and clearly and she was one step ahead the entire time: she had already put our dog in the crate and opened our front door before the dispatch operator could suggest it. While I had known that arrangements had been made to give us a recording of the call, I didn’t know that we were going to listen to it that day and I started to panic when they queued it up: could listening to that call do anything good or would it just bring all of the painful memories screaming back? But something happened as we listened, listened and watched Lily sitting on the laps of the men who saved her: it felt like healing. Towards the end of the tape, you can hear the sirens wailing as the paramedics pulled up to our front door and even from where I was sitting I could feel the relief again, knowing that help was so very close. Crystal is a regular blogger for Cardiac Kids. 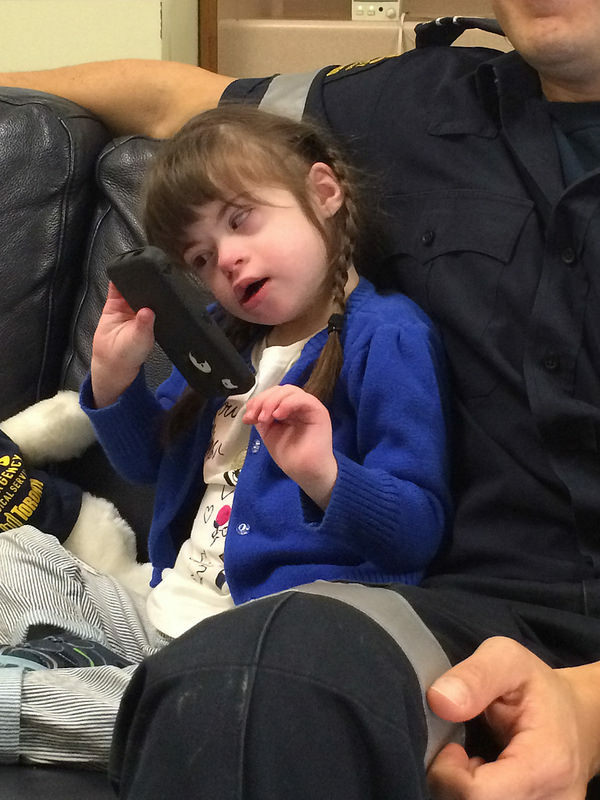 Click here to learn more about her and to read Lily’s story. Stay tuned next week for a post from Laurie. There was a steep learning curve when we first became Lily’s mom’s. While we had known from the beginning that Lily had “heart issues,” we didn’t truly begin to understand what that meant until our first appointment at Sick Kids. We met Lily’s foster mom in the waiting room of the ECHO lab and were perfectly happy to let her take the lead, comfortable playing the role of the casual observers. To our shock though she was just as happy to hand the reigns over to us and forced us to jump head-first into our new role as mothers. In the hour that followed, I learned on the spot how to try and comfort Lily during a needle poke, how she preferred to be swayed instead of rocked as she drifted off to sleep and how quickly she could squirm out of the most tightly swaddled blanket. I felt totally and completely out of my element and it wasn’t long before my self-confidence, which had been high after years of hearing how great I was with kids and what a great mother I would be, started to plummet. In the moment where I truly became a mom, I had never felt more like a fraud. And this is the truth: the learning curve is steep for all CHD parents. Even when you have the diagnosis early: you’ve prepped yourself with all of the reading and research and you’ve reached out to other parents who have travelled this road before us, there is nothing we can do that can prepare us for these first moments. Alongside the “normal” firsts: counting fingers and toes, trying to distinguish between cries, changing diapers while trying not to turn on every single light, you are now thrown head-first into this unexpected world. While I was shocked at how quickly this world became our new normal, standing beside Lily during that first ECHO, I felt as though I had just jumped off the edge of a cliff and didn’t have a clue what was waiting for me at the bottom. Then, out of sound of the wind rushing through my ears, came a firm but gentle hand on my arm and the most incredible words I had ever heard: “You’re doing great Mom.” It was exactly what I needed in that moment, a small bit of encouragement to help me see that I wasn’t a fraud, that Lily and I just had to figure this road out together. We learn fast that we can’t always protect them the way we want to, that we can’t keep bad things from happening. But we also learn, just as quickly, that we can hold them closer, comfort them, find ways to help them work through their own fears and know, always know, that they will never face any of this alone. We don’t always know the right steps to take, the right path to follow and we often find ourselves relying on people to help guide our decisions in the hope that it will help our children survive, but we do know how to bring real life into this medical world; we know how to help them not just survive, but live. When I think about Lily, at 5 days old, going through her first heart surgery alone, it breaks my heart. While I know that there has always been a “Team Lily”, thanks to the many nurses who stopped in her room on 4D to tell us about how they were there to watch her — spending time snuggling her up while they we were working, on their lunch breaks or even once their shifts were done, there is nothing I wouldn’t give to be able to go back in time and be with her, to experience those first moments right alongside of her. I want to be the voice gently whispering in her ear, “You’re doing great baby” and bring her the same comfort that a nurse named Jane once brought to me. What we didn’t know at the time was that a little girl had just been born who would come into our lives and change just about everything. 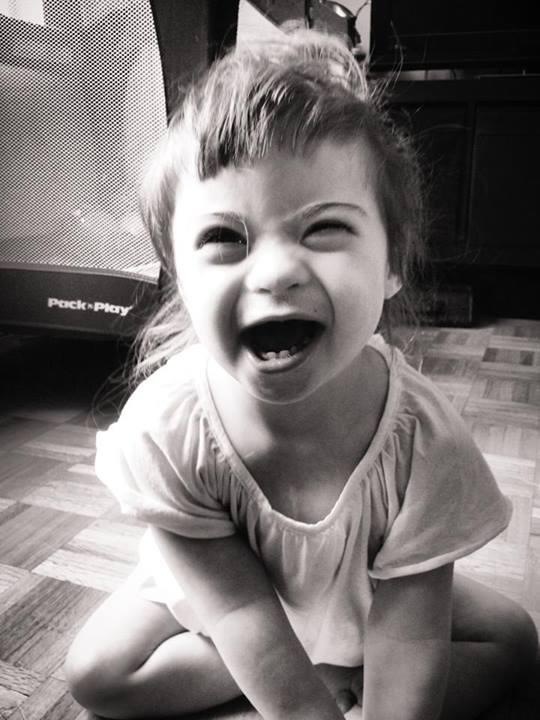 She was born with Down syndrome and with that a couple of the heart defects that are more common with Down syndrome diagnosis. While her birth parents were struggling to make the hardest decision of their lives, this little girl had her first open-heart surgery to help correct an atrioventricular septal defect (AVSD) and co-arctation of the aorta. In the end, her birth parents made the tough decision to place her for adoption in order to give her the best life they could and shortly afterwards our social worker gave us a call – she thought that she had just the child for us. After the span of a couple months (what felt like the longest months of our lives), we finally got to meet our Lily. 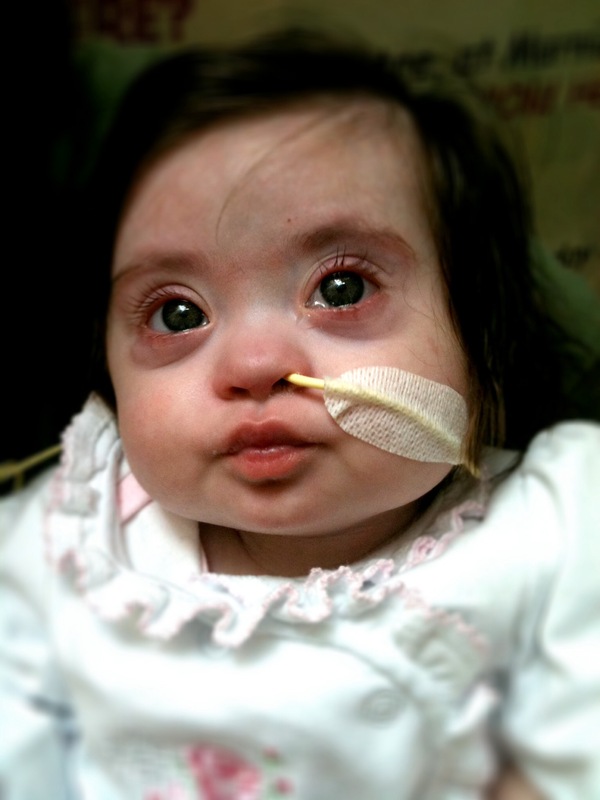 In the long version of this story, there were home visits and a giant learning curve as we learned to feed this tiny girl with an Ng tube and syringe. We learned about the symptoms of heart failure and what to look out for. We jumped in head first, as we joined this little girl for her pre-op ECHO and EKG, and on the day she came home with us for good, we met her amazing cardiologist who walked us through exactly what they had planned for her next surgery. We left that appointment feeling a little overwhelmed and thankful that we had almost a week to prepare ourselves….until the phone rang at 9:30pm that night. There was some concern that another surgery would bump Lily’s the following week; would we be able to bring Lily in for her surgery tomorrow? Time can play tricks on your brain and that day was the longest and fastest day that I have ever lived through. Someone had warned us earlier that Lily’s surgeon often brought families into a room to give them updates at the end of the surgery and not to worry because that didn’t mean he was going to give us bad news. So, when he appeared in front of us hours later, we weren’t shocked when he motioned for us to join him in the smaller sitting room. Then he began to speak. He told us that while the AVSD repair went incredibly well, they were able to confirm a diagnosis of Pulmonary Vein Stenosis. He explained that with this condition, the veins that bring oxygenated blood from the lungs to the heart to pump out to the rest of body narrow and close off completely. He went on to explain that they attempted to repair and open up the veins but that the prognosis was not good: the veins would continue to close over time until Lily lost function of the lung completely. In a blur, we heard words like, “progressive”, “transplant”, and “fatal”. And we just stood there, in total and complete shock: we had just gotten Lily and now we might lose her. Lily’s recovery had a couple bumps in the road: her sternum remained open for 4 days to allow the swelling to recede; she developed a chylothorax which created a number of pleural effusions (pockets of fluid around the heart and lungs). As first-time moms, and now first-time heart moms, we were terrified. We had no idea what any of these were and what they meant for her recovery. While we were surrounded by so much support and kindness from everyone we encountered, we just wanted to be at home but at the same time, felt very secure knowing that there was always an extra set of eyes watching this little girl. Finally, after 3 weeks, we got the golden ticket: we were allowed to go home! 4 days later, we wished we had never left. We had an exhausting 24 hours: Lily wouldn’t settle and would sleep for only 20 minute bursts before waking up in tears. Shortly after I handed her off to Jessica so that I could get some sleep, I heard a scream: Jessica telling me that Lily had stopped breathing. The next few hours are a blur of calling 911, watching paramedics grab her and run out of the house, having her revived at our local hospital and then transferred to Sick Kids, watching as the police shut down Bay Street so they could get our baby there faster. We never did find out what caused Lily’s cardiac arrest, a thought that still haunts us to this day. After being readmitted to Sick Kids an ECHO and heart catheter showed that Lily’s left pulmonary veins had closed off completely and she no longer had function of that lung. They also found that a blood clot had formed on her tricuspid valve. There was no way of knowing which of these caused her cardiac arrest or if it was something else entirely and suddenly we were in a new reality. Within 3 days, Lily started having seizures that were indicative of a brain injury, which was confirmed by an EEG and MRI. It seemed as though the cardiac arrest had hit a giant RESET button on Lily’s development and we had a brand new infant. The brain injury affected her sight and caused a Cortical Visual Impairment: for days, we shone flashlight and light-up toys in front of her, hoping desperately for a reaction but she looked right through them. That was 2 ½ years ago and it’s been the most amazing journey. We’ve had our share of struggles: worrying about weight gain and a developmental delay that sometimes feels impossible to overcome. But then we just look at Lily and see all of the amazing things she has done since that terrible, horrible, no-good, very bad, day. Her vision has come back, she is babbling and giggling up a storm and she is starting school in September. Her heart is strong and her lung pressures have remained stable: we are on yearly ECHO’s! While we have no idea how her future will play out – the word transplant is still on the horizon – she amazes us every single day and she continues to astonish us with how much willpower she has just to keep moving forward. Crystal Trumper is a regular blogger for Cardiac Kids. Read her bio and more about Lily’s story here. Be sure to check back next week for Jean’s first post!